Directions: Apply a dime sized amount of Miracle RepaiRx Anti-Breakage Serum to help smooth the strands and lock in moisture. To use as a hot oil treatment, warm oil in microwave for thirty seconds. Allow to cool for one minute. Apply oil to wet hair and cover with a shower cap for twenty-five minutes. Rinse out and condition as usual. I went to target for everything but hair products and of course thats what I ended up getting. I saw the anti breakage serum and had to grab it. My daughter had severe breakage from a bad relaxer and this has been getting her hair back in order. I’ve only used it a handful of time on her so far and it’s been amazing. I used this to see if I felt any benefits when heat styling. I don't straighten my hair often, but usually when I do, the curls come back way too soon and I have to keep straightening it to get a long life out of the style. When I put this in, I noticed that the curls didn't come back until the third day, which is a huge benefit. I also felt that this kept my hair moisturized longer and made it smell so good, not like the burnt hair smell. Lastly, it helped my hair stay down, since the winter makes it have a lot of static. Love everything about the anti breakage serum My hair has been breaking so bad since I’ve been pregnant and its been helping keeping my hair moisturized and I’ve noticed a drastic reduction in breakage. I absolutely love this serum. I’ve been natural my entire life but never realized how much I was still damaging my hair with heat and color. 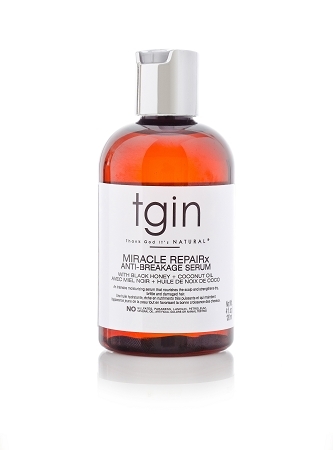 My friend recommended the anti breakage serum and it holds true to its name. I would lose so much hair just from shampooing but I haven’t had that issue at all since then. I absolutely love this serum. My only wish is that they came out with this serum sooner. It’s lightweight but not sticky and keeps my hair from excessive shedding and breakage! A little bit goes a long way too.